The NanoMaker was successfully used for direct writing by e-beam the sharp tips for Atomic Force Microscope. So called "Whisker Type" tips are used to go deeper inside narrow gaps when the standard cantilevers fail to measure the bottom and to control near vertical sidewalls. For more information look at site of AFM manufacturer NT-MDT Co. Fig. 1a. 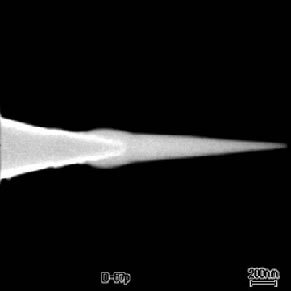 Front view of a direct written sharp tip on an AFM cantilever. Fig. 1b. Side view of the same tip. Fig. 2a. SEM image of FEB tip specially designed for measurement of samples with near vertical sidewalls. Fig. 2b. 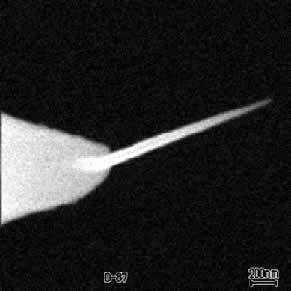 SEM image of four FEB tips grown on the silicon tip in accordance with preset sketch.